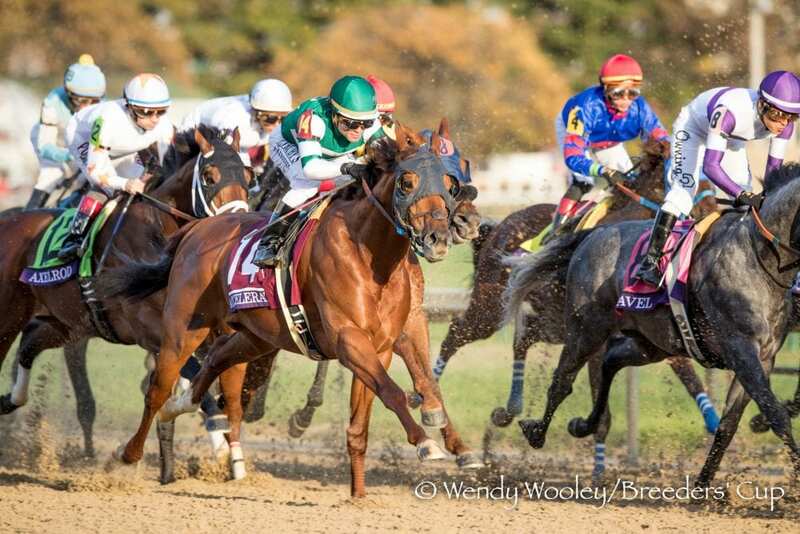 Fresh off a rousing victory in Saturday's $6 Million Breeders' Cup Classic, Hronis Racing's Accelerate concluded the year in first place in the final NTRA Top 10 Thoroughbred Poll of 2018, the NTRA announced today. Accelerate received 24 first place votes and 437 points. Justify, who retired earlier this year after becoming the sport's thirteenth Triple Crown winner, secured second place with 19 first place votes and 380 points. The race is now officially on to see who will be crowned Horse of the Year on January 24, 2019 at the 48th annual Eclipse Awards at Gulfstream Park near Miami, Fla. This week's voting results marked the first time this year that Accelerate has received more first place votes than Justify and also marked Accelerate's twelfth consecutive week in first place. Since the advent of the Eclipse Awards in 1971, four other Triple Crown winners—Secretariat, 1973; Seattle Slew, 1977; Affirmed, 1978; and American Pharoah, 2015—each received the gold Eclipse Award statue symbolic of Horse of Year as three-year-olds. The final NTRA Top 10 Poll was dominated by Breeders' Cup winners ranked behind Accelerate and Justify. Monomoy Girl, who capped a stellar 2018 campaign by defeating older fillies and mares in the Longines Breeders' Cup Distaff, ranked third in this week's poll with 357 points. Maker's Mark Breeders' Cup Filly and Mare Turf winner Sistercharlie was fourth in the poll with 234 points. Juddmonte Farm's Enable, who received three first place votes, thrust herself into the Horse of Year conversation by becoming the first racehorse to win the Qatar Prix de l'Arc de Triomphe Prix de le Arc and Longines Breeders' Cup Turf in the same year. Enable debuted in fifth place in this week's poll with 218 points. Breeders' Cup Dirt Mile winner City of Light also received 218 points to tie for fifth in the poll, while Twinspires.com Breeders' Cup Sprint winner Roy H was seventh with 205 points. Undefeated two-year-old colt and Sentient Jet Breeders' Cup Juvenile winner Game Winner (100 points) was eighth, followed by Breeders' Cup Juvenile Fillies Turf winner Newspaperofrecord (65 points) in ninth place. Yoshida, a Grade 1 winner on dirt and turf this year, finished in 10th place with 61 points after finishing fourth in the Classic behind Accelerate. The NTRA Top Thoroughbred polls are the sport's most comprehensive surveys of experts. Every week eligible journalists and broadcasters cast votes for their top 10 horses, with points awarded on a 10-9-8-7-6-5-4-3-2-1 basis. All horses that have raced in the U.S., are in training in the U.S., or are known to be pointing to a major event in the U.S. are eligible for the NTRA Top Thoroughbred Poll, which continues until November 5, after the Breeders' Cup World Championships. This entry was posted in Breeders' Cup and tagged accelerate, Breeders' Cup 2018, breeders' cup classic, enable, Justify, monomoy girl, ntra top 10 thoroughbred poll, Thoroughbred poll by Press Release. Bookmark the permalink.